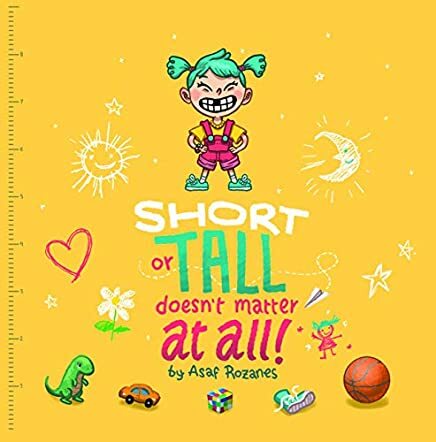 Short Or Tall Doesn’t Matter At All by Asaf Rozanes is a story about a little girl named Mia who is shorter than the kids in her class. Mia’s classmates pick on her about her height, excluding her from playing games with them. Mia is so sad about this act of bullying that her dad relates a story to help her understand what really matters in life; her height has nothing to do with the important things. Mia pays attention to her father’s story but how will it help her with the treatment she receives at school? Will her father’s advice help her change the way her classmates think and behave? Don’t forget to look for the hidden hearts in the illustrations and enjoy the coloring pages at the end. Short Or Tall Doesn’t Matter At All is a beautiful story about a little girl who is picked on in school because she is short. The plot is focused and planned so that the story delivers the anti bullying message to help young kids understand that they are not alone and that something can be done. The characters are easy for kids to identify with and relate to and are wonderfully illustrated so that kids can see as well as read how bullying can disrupt a person’s life. I loved Short or Tall Doesn’t Matter At All and the powerful message of understanding, compassion and friendships that can transpire even from a bad beginning. Rozanes is a very skilled author that I hope will share many more stories. I recommend this story to anyone with children so that they can learn that bullying is never okay and how to cope if they find themselves a victim of cruel judgment that has nothing to do with how good a person is.